Cocoa nibs, vanilla bean, and mint sprigs flavor Field’s choco-mint stout, a natural with Thin Mints. With peanut butter and jelly sandwiches in mind, Field beer-makers partner a mixed-berry-infused pilsner with peanut butter, chocolate and shortbread Tagalongs. I repeat: I want to go to there. But what’s truly delightful about this discovery is that it’s a) a Girl Scouts of America-sanctioned event, and b) it’s not the only one! Craft Beer & Cookie Fest is “held every year in various and multiple locations,” per the website for Girl Scouts Of Eastern Washington And Northern Iowa; in just a few minutes of searching, I found upcoming events in Aurora, Illinois; Covina, California (bonus points for anyone who sings the song in the comments); Bloomington, Illinois; Durham, North Carolina; Kalamazoo, Michigan; San Francisco, California; and Austin, Texas; plus a Cookies and Cocktails event in Tucson, Arizona for good measure. All sounds pretty good, all makes me feel pretty dumb for not knowing about them before. But my “wow, how did I not know about this, I am oblivious” googling had one particularly happy side effect: I found one in Chicago. 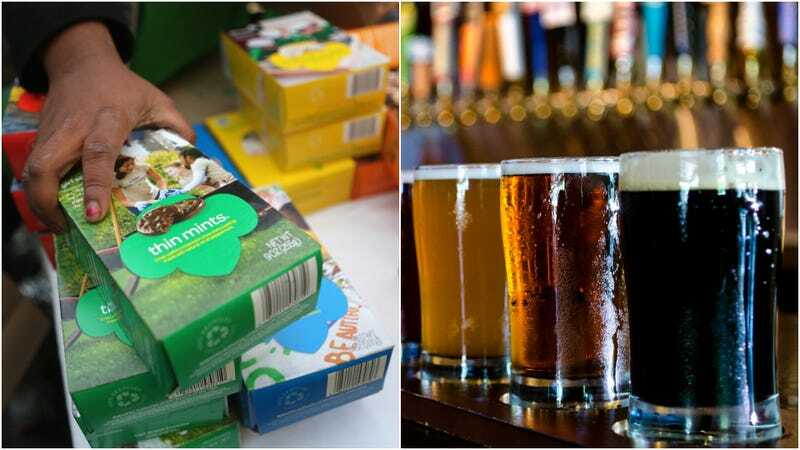 Cheers, and enjoy your Samoas.